HDL cholesterol, or good cholesterol, contributes to well-being and health while high levels of LDL are a risk factor for heart attacks. Sources of LDL cholesterol are meat products. 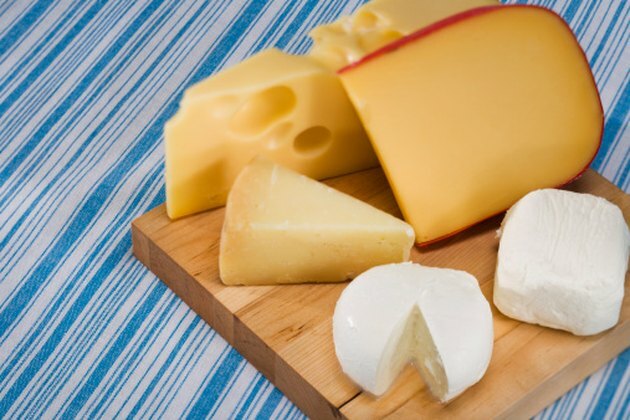 Cheese does contain cholesterol, so pay attention to cholesterol content and serving size to make sure that you are not exceeding the American Heart Organization's daily recommendation of 300 mg (or less) of cholesterol. Regular, or full-fat cheese, contains the most cholesterol. The following list assumes a 1-oz. serving size of each cheese. Swiss cheese contains 26 mg, cheddar cheese contains 30 mg, and American cheese has 27 mg of cholesterol. Colby cheese contains 27 mg, feta cheese contains 25 mg, blue cheese contains 21 mg, and Asiago cheese contains 25 mg of cholesterol. Fontina cheese has 33 mg, shredded Parmesan has 20 mg, Romano contains 29 mg and provolone 19 mg. Mozzarella has 22 mg, Brie contains 28 mg, Gorgonzola contains 25 mg and a stick of mozzarella string cheese contains 15 mg. Monterey Jack contains 25 mg of cholesterol. Gouda cheese contains 32 mg and Pepper Jack contains 30 mg of cholesterol. Havarati cheese contains 25 mg of cholesterol, Four Cheese Mexican blend contains 25 mg, Gruyere contains 31 mg and American cheese (white) contains 30 mg of cholesterol. Low-fat cheeses contain significantly less cholesterol than regular cheese. The low-fat cheeses listed are based on a 1-oz. serving size. Low-fat cheddar cheese contains 4 mg of cholesterol, while low-fat Swiss cheese contains 10 mg of cholesterol. Low-fat American cheese contains 6 mg, low-fat Colby contains 10 mg and low-fat feta cheese contains 8 mg. Low-fat Muenster contains 18 mg, cottage cheese contains 4 mg, and ricotta cheese boasts 9 mg of cholesterol. Low-fat mozzarella cheese contains 20 mg of cholesterol. Fat-free cheese contains the least amount of cholesterol. The cholesterol content of the fat-free cheeses is based on a 1-oz. serving. Fat-free cheddar cheese contains 3 mg of cholesterol while fat-free American cheese contains 2 mg of cholesterol. Fat-free mozzarella contains 5 mg of cholesterol, fat-free feta contains no cholesterol, and fat-free ricotta contains 5 mg of cholesterol. Fat-free cottage cheese contains 1 mg of cholesterol, while fat-free American cheese (white) contains 7 mg of cholesterol. Cholesterol Levels: What Numbers Should You Aim For? What Does Too Much Cheese Do to the Human Body? What Are the Health Benefits of Eating Goat Cheese?